The first Mapperley Colliery shaft was sunk in 1872, known locally as “Simon Pit”, it remained in operation until 1965. In 1891 the company extended its mining operations to neighbouring Stanley. A lease was agreed with William Drury Lowe of Locko Park to mine the Kilburn coals, resulting in sinking a second shaft on the site beside West Hallam Station in 1895. The Stanley Colliery was known as “Nibby Pit” until it closed in 1959. From these two collieries 66 men lost their lives in the 1914 -18 war. 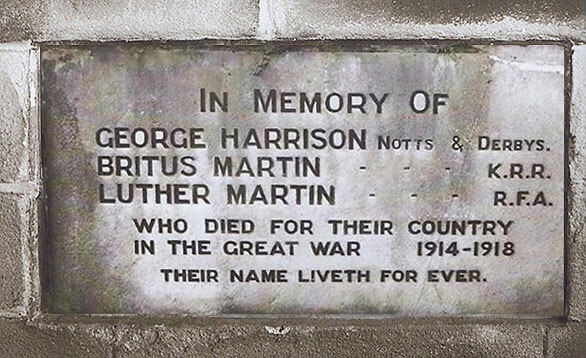 Two of these men were born in Mapperley and were brothers, Britus Martin and Luther Martin. Britus was a Rifleman in the 7th Battalion King’s Royal Rifle Corps. He was killed in action in Belgium on 30 July 1915 age 25. Luther was a driver with the 34th Division Ammunition Column Royal Field Artillery, he was killed in France on 23rd March 1917 age 35. 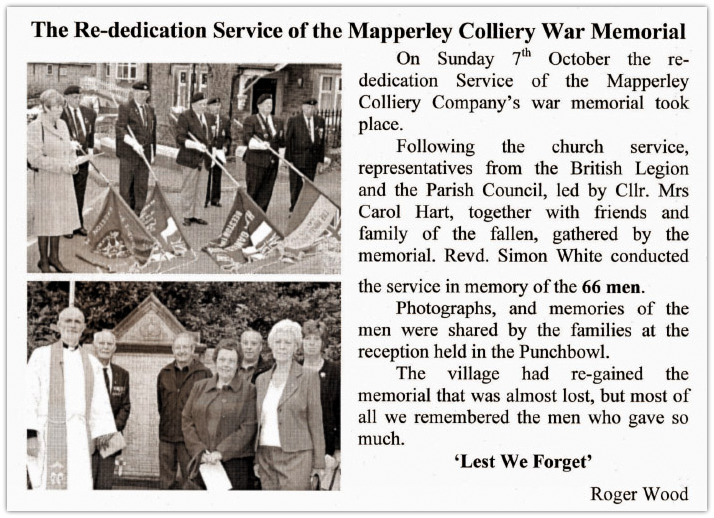 They were the sons of Henry and Fanny Martin of Park Hall, Mapperley. The company decided to provide a Memorial Hall, to be used by residents from the surrounding villages. Tennis courts, a bowling green and the hall, were opened on Station Road, West Hallam in 1920. The hall was refurbished and renamed the Silver Jubilee Club in 1977 following the Queens 25 Anniversary celebrations. Unfortunately the building and facilities deteriorated during the 1990’s and it was finally demolished in 2005, making way for the housing development, Jubilee Court. 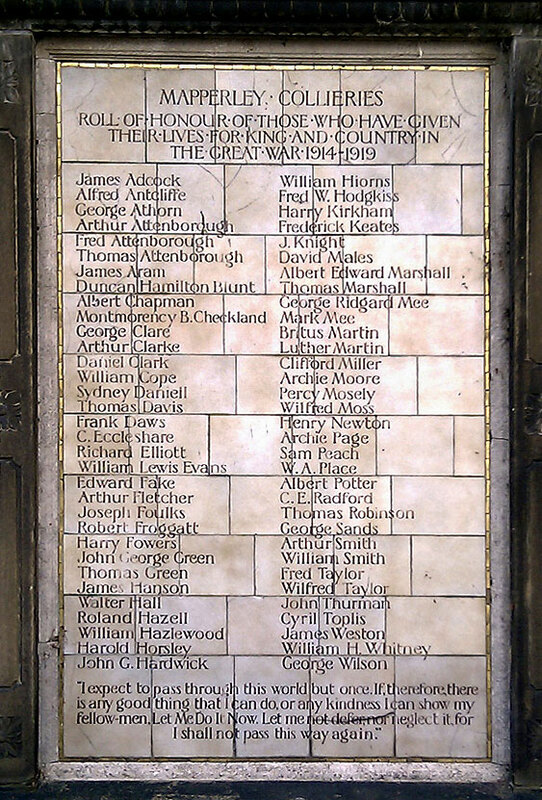 The Roll of Honour was removed by the builder but fortunately saved from demolition just in time. It now sits beside the West Hallam Memorial situated by St Wilfrid’s Church. The Memorial is constructed of a series of glazed tiles, with a stone surround, said to represent the interior of a colliery winding engine house. The names of the fallen are listed below. 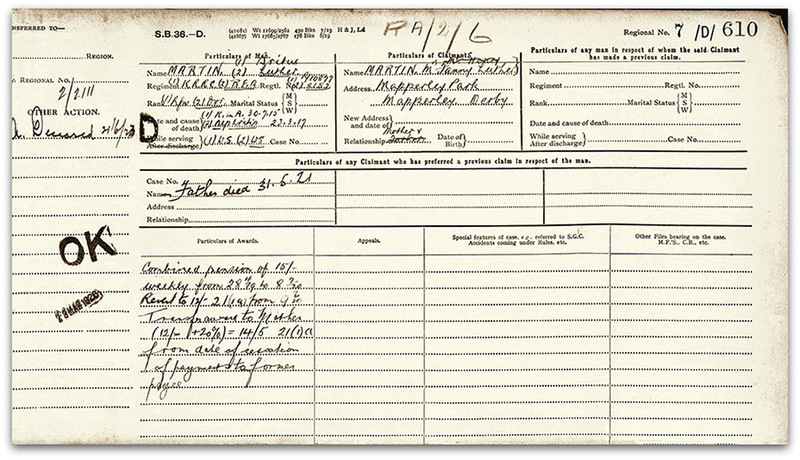 Britus Martin: Kings Royal Rifle Corps buried in Ypres, Belgium aged 25. Died 30th July 1915. Son of Henry & Fanny Martin. Luther Martin: Royal Field Artillery buried in Calais, France aged 35. Died 23rd March 1917. Son of Mrs F Martin of Park Hall. Just two of the sixty-six men who worked for the company and died in the war. Miners were required in the war for their tunnelling expertise, which were needed when tunnelling under enemy territory and placing explosives. George Harrison: Sherwood Foresters aged 21. Died 25th September 1916. Son of Thomas Harrison of Yew Tree Farm, Stanley. 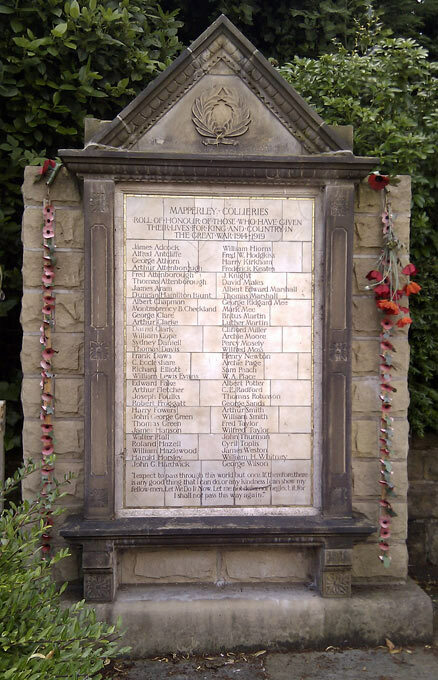 has now been erected beside the main War Memorial in West Hallam village. The Roll of Honour is dedicated to the 66 men who lost their lives in the 1914-18 war.